It’s come to that time again when I need to compile a Income Report. It’s always a bit of a scary time, as I have to out all the numbers together and analyse things a bit. I know that my numbers are relatively small-fry compared to so many people, but at the end of the day, I love doing all things Pure Sweet Joy and would probably be doing it even it brought in nothing! 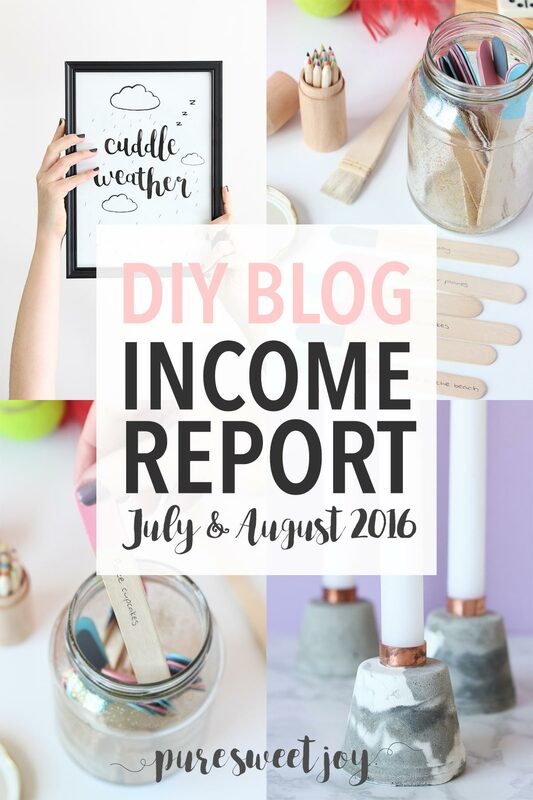 Why am I sharing my blog Income Report? The point of showing you my income report is so that you can come along with me on the journey of improving Pure Sweet Joy. I’m aiming for transparency that can keep me striving for my best, as well as help you in your own blogging journey. I know, I know, it’s not only about the numbers, but it is a good way to measure progress. I intend to post my monthly Google Analytics stats, along with any expenses and earnings that I may have received. I’ll also speak about any changes or improvements made, accomplishments achieved and challenges faced. As always, time is an issue. Partly because there isn’t enough of it and partly because I don’t always use it very well. Last month I was also pretty busy with a little side project, which turned out AMAZING, but it did mean that there was less happening over here. In my last report I aimed to update my creative market and Etsy stores a bit. I have made some changes, but there is still more to do. I’ve also still been trying to interact more on social media groups and have joined a few more. There are quite a few ideas swirling around my brain at the moment. I’m busy trying to figure out what new avenues I should pursue for Pure Sweet Joy, such as the side project mentioned above, so watch this space! I’d love to see your Pure Sweet Joy DIYs. Show me on Instagram using #puresweetjoyblog or email me at deborah [at] puresweetjoy [dot] com. Like what you see here? Follow along on Facebook, Twitter or Bloglovin or subscribe to the newsletter for exclusive access to the latest news and freebies. Be the first to know about sales, new products and exciting news!